Nominations are now open for the 2019 Dragon Awards! The fourth annual, fan-chosen awards, have proven to be the must-see, watch, and play guide for any sci-fi and fantasy fan! Make your voice heard by nominating your favorite today! In a world of the ordinary, the Dragon is most astonishing. Its heart burns with determination and desire as it soars from page to canvas to screen. The Dragon’s inner fire elevates it above the mundane, and once released, inspires respect and awe from all who witness its greatness. Like the Dragon, our recipients are extraordinary and unique. Fueled by the passion for their art, they have spread their wings and soared above us all. Their inner fire, the burning in their hearts and souls, cannot be restrained. Once set free, their work, their fire, has influenced and inspired countless others, burned into our hearts and minds forever. In the spirit of the Dragon and with infinite admiration, we created The Dragon Award as a token of their individuality and greatness. 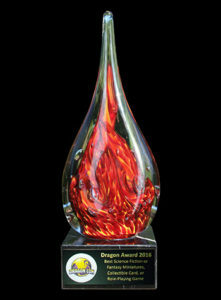 We are pleased to present all of our award winners with the essence of the Dragon, its fire, suspended perpetually as a permanent reminder of their contributions.